Innumerable flaws and severe degradation lay concealed behind the building’s stucco cladding. In spite of the building’s recent vintage, severe fungal degradation of its wood framing compromised its overall structural integrity. 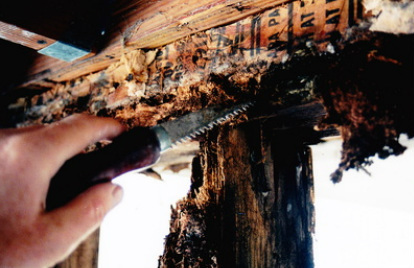 The PL:BECS investigation uncovered widespread and severe fungal decay throughout the building. 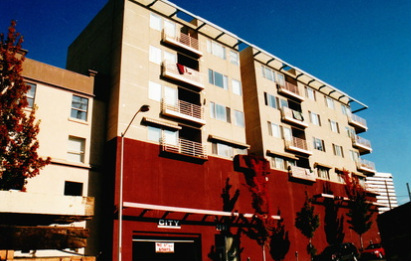 Project Summary:	This low-income apartment building, consisting of 4 levels of wood-framed construction atop a cast-in-place concrete base, had been experiencing severe and widespread leakage since its construction only 12 years prior to PL:BECS involvement. The leakage resisted the developer’s repeated efforts to correct the problem. Exterior envelope systems included torch-down roofing, traffic-bearing waterproof decks, stucco cladding, and residential windows. PL:BECS Services:	PL:BECS was retained to evaluate the extent of the building’s problems, determine their causes, and assist the developer as an expert witness in an effort to secure reimbursement for the various flaws from the many sub-contractors responsible for these problems. 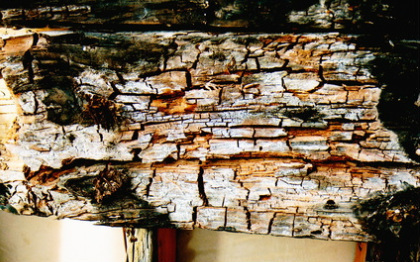 The PL:BECS evaluation uncovered extreme degradation of the structure, with profuse fungal decay affecting essentially all of the framing. 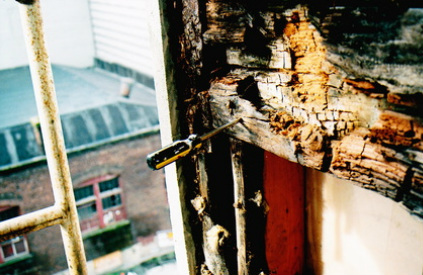 This decay resulted from innumerable flaws in the installation of the stucco cladding, windows, deck waterproofing, roofing, flashings, and related elements. The degradation was so severe that the building had become structurally unsafe, and needed to be vacated within a few years following the initial investigation. PL:BECS assisted the developer’s attorney in pursuing reimbursement from the various subcontractors. Thorough documentation of the construction flaws, combined with similarly complete documentation of the resultant and severe damage, proved useful in securing such reimbursement even 12 years after initial construction.